Another Vestact recommended stock in New York portfolios is streaming entertainment service Netflix. The company has a fascinating history. It was founded in 1997 as a DVD movie distributor and didn't start offering online streaming until 2007. It was listed on the stock exchange in 2002, when it had just 600 000 subscribers, all of whom were in the US. It passed the 100 million-subscriber mark in April 2017, and now has over 137 million subscribers. It only started expanding internationally in 2010, when it launched in Canada. Today it's available in over 200 countries. People love TV content, but they don't love linear TV anymore, where channels present programs only at particular times on non-portable screens with complicated remote controls. Internet entertainment is on-demand, personalized, and available on any screen, and Netflix is the global leader. Given its enormous library of compelling content, the monthly fee of $14 is really a bargain. Interestingly, Netflix co-founder and CEO, Reed Hastings, encourages account sharing. 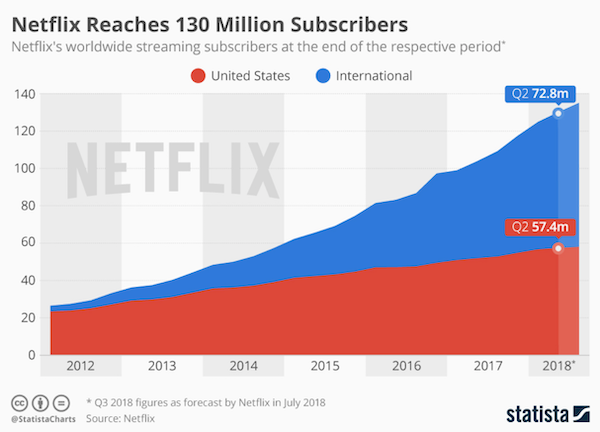 He has called it a "terrific marketing vehicle" that helps expose Netflix to new viewers, noting that those who initially use someone else's account often become paying customers down the road. Many youngsters only ever watch Netflix content on their smartphones. Watching the latest must-watch series on Netflix has become a global phenomenon. Staying home and binge watching is the way the middle classes spend their evenings these days. There is even a phrase to describe that: "Netflix and Chill". Haha, no. That phrase actually means something else. According to Urban Dictionary, "Netflix and Chill" means having s#x with your partner, with Netflix on in the background. Netflix will spend $8 billion on original content this year, and "a lot more" in the future. It is striking deals daily with the world's top producers, writers, graphics experts and actors. Some stars like Adam Sandler premiere all of their content exclusively on Netflix worldwide. It does of course have competition such as Hulu, Amazon Prime and YouTube.. From 2019 onwards, Disney is also launching a new content streaming service. The recently released Netflix third quarter results exceeded consensus expectations, and the stock shot up yesterday. Subscriber net adds came in just below 7 million (almost 6 million of which were outside the US). What is more, they provided fourth quarter guidance for another 9.4 million adds, which is far higher than most analysts' expectations. That's a reflection of the strength of their content line-up for the rest of 2018, new distribution partnerships in emerging markets and growth in the addressable audience, particularly in earlier stage mobile-first markets. The company has a lot of debt, and thin profit margins. However, it is growing fast and has the ability to increase margins in future with modest fee increases. We remain Buy rated on Netflix and believe the shares will continue to significantly outperform. Only 15% of our customers in New York own Netflix (59 out of 407). Make a plan to add it to your portfolio now!